This is the second year in a row that the Hope Mill Theatre has been nominated in the fringe theatre of the year category. This relatively young venue, housed in a grade II-listed former cotton mill, was founded by Joseph Houston and William Whelton. To create a boutique producing venue in Manchester, they turned the mill’s old engine room into a 120-seat theatre with cafe and bar. Its focus on musical theatre led The Stage’s associate editor Mark Shenton to call the venue “Manchester’s Menier Chocolate Factory ”. The venue is completely self-funded, receiving no money from the local council. Since opening, it has helped reshape Manchester’s theatre scene, programming five in-house shows. The theatre’s stagings of Yank! and Hair , both co-productions with Katy Lipson and Aria Entertainment, have transferred to London, the latter in a reworked production in the subterranean Vaults space. The Hope Mill’s revival of Pippin  will also transfer to London next year. The venue launched Powerhouse Plays, a new-writing initiative in January 2017, which is designed to support emerging northern writers. It has also proved a hit with local audiences and since opening its doors more than 20,000 have visited the theatre. The Hope Mill also recently signed the Equity Fringe Agreement for all its in-house productions, the first fringe venue in the north to become part of the agreement. Despite losing regular funding from Arts Council England on the day that Paul Miller started as artistic director in 2014, the Orange Tree Theatre in Richmond – London’s only permanent in-the-round theatre – has refined itself as a programmer of adventurous and ambitious work. 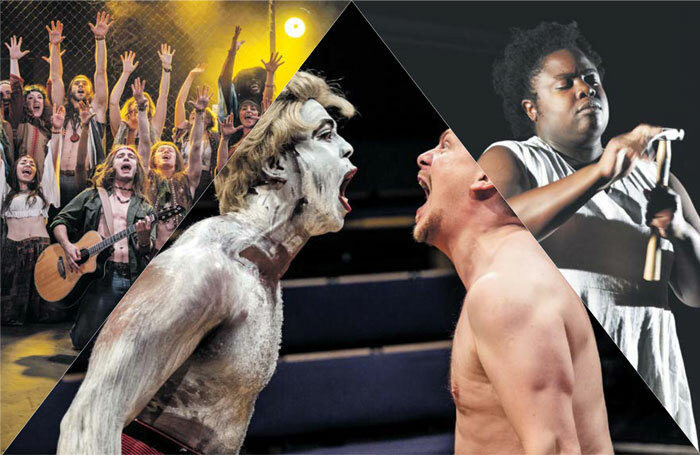 This year has been particularly strong, including revivals of Clare McIntyre’s Low Level Panic , Roland Schimmelpfennig’s exciting, experimental play Winter Solstice  and Ned Bennett’s bold staging of American playwright Branden Jacobs-Jenkins’ layered and audacious play An Octoroon . This last production, like Pomona  before it, will transfer to the National Theatre in 2018. The Orange Tree has worked in partnership with Farnham Maltings, English Touring Theatre and other companies in 2017. Miller’s production of French Without Tears  with ETT toured to nine venues around the country while the delightful two-hander Jess and Joe Forever, co-produced with Farnham Maltings, toured to 11 UK venues and was a standout show of the Edinburgh Festival Fringe. Training and development remains a central part of the theatre’s work and it launched a new MA in theatre directing with St Mary’s University. There were five directors in residence over the year, all of whom helmed productions in the venue’s Directors’ Festival in the summer. The Orange Tree has long inhabited a much-valued position at the heart of Richmond’s community. Miller and the team have broadened its programme in a way that has led to the theatre engaging with a wider cross-section of Richmond residents, as well as establishing the venue as a vital part of London’s theatre ecology. Since its first fringe programme in 2011, Summerhall has transformed the ecology of the Edinburgh Festival Fringe. Over the past few years, it has drawn focus away from the ‘big four’ and created a social and artistic hub for theatremakers. Housed in Edinburgh’s imposing former veterinary college and consisting of a number of idiosyncratic performance spaces of varying size, with names such as the Old Lab and the Dissection Room, it remains open all year-round as an arts venue. Highlights of the 2017 line-up, overseen by festival programme manager Verity Leigh, included Selina Thompson’s Fringe First and The Stage Edinburgh award-winning Salt , Sh!t Theatre’s DollyWould , Middle Child’s All We Ever Wanted Was Everything , Chris Thorpe and Rachel Bagshaw’s The Shape of the Pain . During the fringe, Paines Plough’s pop-up Roundabout  pitches up in one of its courtyards, and over the last couple of years, it’s also been the base of Northern Stage’s fringe programme. The 2017 programme also included a strand of Canadian work at nearby King’s Hall, a season of work by Arab artists, and the offsite Army@Summerhall  strand of performance. Summerhall also offers an artist development programme, supported by Creative Scotland. This consists of two strands in which artists can develop new work: the Lab and the Space . While there have been issues with payment of artists in the past, these have now been resolved. It also boasts an onsite gin distillery.